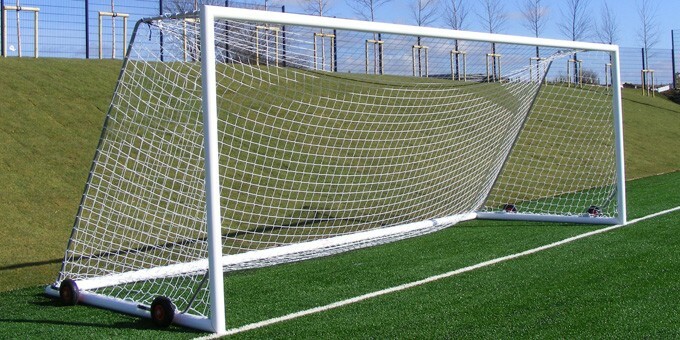 Top of the range self-weighted aluminium football goals. Uprights, crossbars and base frame from 100mm x 110mm elliptical reinforced aluminium. Complete with international net supports, top diagonal brace & lock-on nylon net hooks. 4 no. Easy-Lift 260mm diameter non puncture wheels per goal, engaged via a cantilever arm. No manual lifting involved. Base frame integrally weighted. Complete with 3mm thick white polyethylene nets. These goals require no further anchorage to conform to BSEN748. Junior size - 6.4m x 2.13m. Senior size - 7.32m x 2.44m.